Made from thick, combat-quality leather, our wholesale arm armour at LARP Distribution complements most re-enactment armour styles, such as medieval knights and soldiers. We carry wholesale leather arm armour with articulation and molded shapes that allow a full range of movement in battle, while also providing excellent protection. This full arm leather armour attaches with straps and buckles and can be connected to a gorget if desired. The functional design of our hardened leather arm armour makes it an ideal choice for LARPing or SCA. 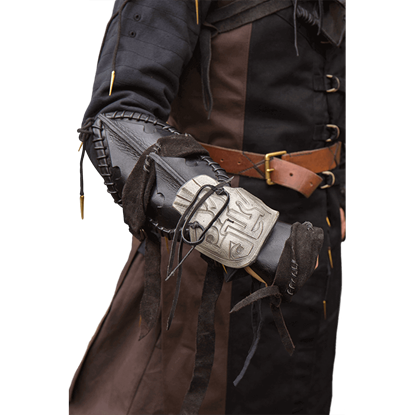 LARP Distribution offers an excellent variety of wholesale leather bracers, wholesale leather wrist cuffs, wholesale leather vambraces, and wholesale leather arm guards that go great with our other pieces of leather armour. We carry these pieces in a wide range of styles, including Celtic, medieval, steampunk, fantasy, pirate, samurai, and more. They come in many different colors and are decorated with details like vines, dragons, stars, gears, metal studs, and other features. These wholesale leather armour items make an essential part of archer attire, while also providing protection for close combat LARPers. Wear the Dark Elf Leather Bracer whenever combat calls for a shadowy approach. 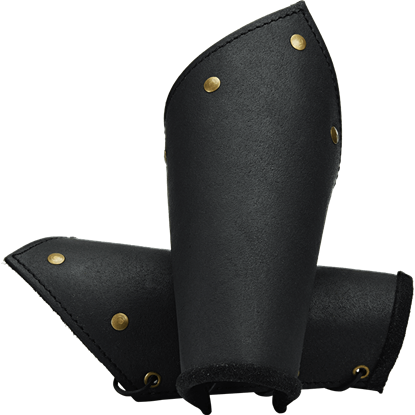 This single arm bracer has a unique and intimidating construction, made from a series of black leather panels with pointed ends layered over each other. Arm protection is a key part of any armored look. This was true in European armors as well as in oriental designs. These Leather Samurai Bracers mimic the Japanese kote, which were worn by samurai as a part their traditional armor. 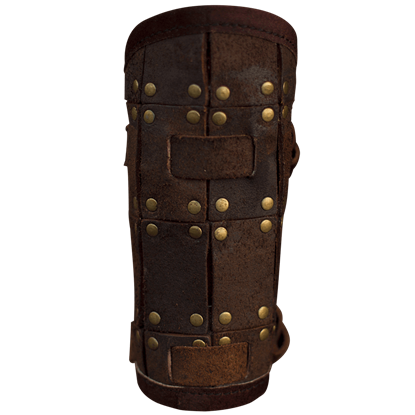 Inspired by brigandine armour from the 15th century, these fancy leather bracers are lighter without the metal plates that would have been riveted into the armour. These RFB Fighter Bracers are designed to protect the forearms. 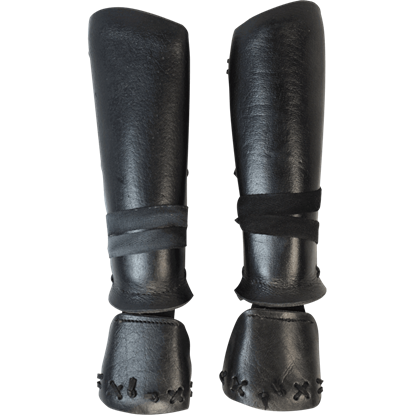 These Knights Battle Bracers are made of soft, chrome-tanned leather and have a suede backing so they are very comfortable to wear. They feature antique brass rivets and grommets, with lace up closure. The chieftain calls forth our warriors. A rich port to the West has caught his eye. A swift longship waits for us upon the shore. Be equipped with your best weaponry and armour. Reinforce your forearms with the RFB Viking Bracers. 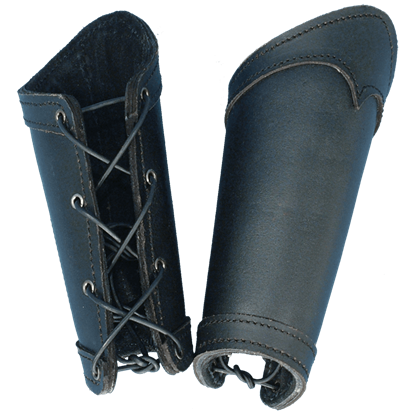 The Squires Leather Bracers are ideal for LARP use and even Theater productions or plays. They are made from segments of leather that are sewn and laced together. 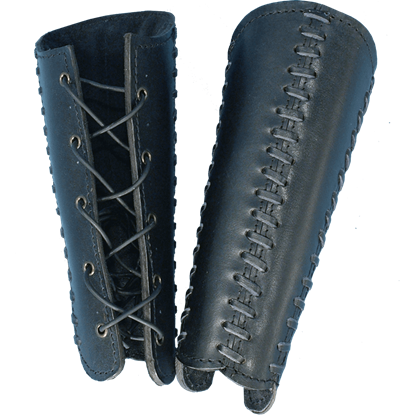 The bracers are backed with a soft suede for comfort when wearing. Never underestimate what a pair of leather bracers can do you for. 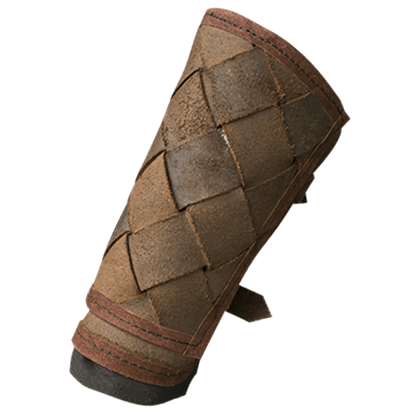 These Warriors Leather Arm Bracers are made from quality materials and offer not only a touch of medieval style but also enhanced protection for any warrior to wear!